We start the week with sharing a few new improvements to the platform with you. Before starting to work on your animation, sharing a storyboard with your client can be very effective. Thanks to an extension to the page settings, this can be shared more easily. We have a new feature where you can show images on your preview page all in one row. Next to the grid view and the 1 centered column, this the next structure to choose from for your page setup. It can be helpful to show your image from left to right when trying to show the timeline of the animation. You can find this new setting on the Page setup for every existing and new preview page. Our aim is to make your daily work as efficient as possible. That’s why we started Adpiler. But rolling out new features also means more choices to make for you in the process on Adpiler. That’s where the new Defaults-tab comes in. 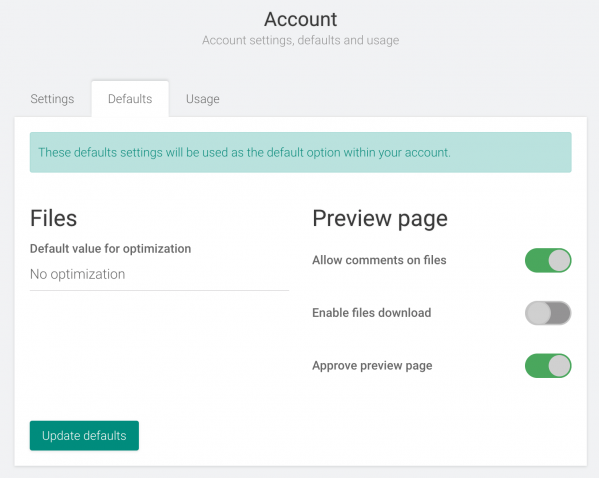 Set some default settings, which will be the default setting account-wide. Do you in most cases disable the files download for your clients? Just change it once at the Defaults-tab, and from then every time you create a new preview page that setting is already switched off. Do you prefer not to use any image optimization? Change the setting in your Defaults-tab, and by default images are won’t be optimized, unless you decide to pick another option when uploading. The Image Generator simply generates the fallback (or backup) images for your HTML5 ads. By adding a simple button, you won’t spend time anymore on finding the right preview page in the Image Generator.